This week in cooking and stories around the world, we made not only a trip to the Old Continent, but a trip in time too. As a lover of all things girly and dainty, Miss I loves her real china tea set, so I came up with the idea of making a Victorian Tea time and tales party for the girls. After much research on the type of cake we were going to make, the perfect recipe and the right storybook, we settled for a Classic Victoria Sandwich and The Victorian Fairy Tale Book edited by Michael Patrick Hearn. First, the story of tea time and how it came about. According to Food Timeline, the afternoon tea began with the Industrial Revolution, in the early 1800’s. With the economic and social changes brought by the Industrialization of the English society, the main meal of the day was moved from around noon to later in the day. So tea time became a sort of way to tamper the hunger at around 4. High tea was served a little later, and despite what the name might suggest, it wasn’t the “more aristocratic” version of tea time, but it’s exact opposite: high tea was called so because it was served at high tables where people sat on stools or just stood up to take their tea an a heavier version of sandwiches and finger foods buffet style. Anna, the duchess of Bedfort, is generally credited by food historians to have started the custom of tea parties in the 1830’s. Those reunions were between 3 and 4 PM, and there they served dainty sandwiches, little cakes and scones as well as tea. Another point to mention is that at around that time, Baking Powder was invented, which allowed the creation of fluffy and buttery pastries. The Victoria Sandwich is one of the little cakes that was served back then. It’s called a sponge cake, but it really is more of a pound cake because of the way the ingredients are creamed and integrated. It’s filled with whipped cream or butter cream and (traditionally) raspberry jam.I looked at several recipes, until I found a wonderful article from The Guardian about a lady who had gathered the recipes from the heavy weights of the British cuisine and tried to make all of them, in search for the perfect one. I took her recipe and made a couple of modifications, the first one being that I wanted to make mini-cakes instead of a large cake… for which I used a cupcake pan. I have to confess I didn’t add the extra Baking powder nor the milk from her recipe because I simply forgot… but our cakes turned out light, buttery and delicious. Here are the cakes cooling off on the rack. The most difficult part with my recipe was handling the dough, as it was very sticky. I managed using a pastry bag, and pouring the batter onto the greased cupcake pan. For the final picture I used my daughter’s toy tea set, which they then proceeded to use and have their tea party with (along with some decaf English Breakfast tea). Preheat the oven to 350ºF with the rack in the middle rung. Generously butter a 12 cupcake pan. With an electric mixer with a paddle attachment, cream together the butter and caster sugar, until the butter turns pale yellow and the mixture fluffs up a little bit. Beat the eggs in a separate bowl, then add to the butter-sugar mixture, making sure to scrape the sides to incorporate everything well. Mix the self-rising flour with the pinch of salt, and sift on top of the butter mixture. Mix lightly, to make sure the bubbles formed in the butter are not lost. The dough is going to have the consistency of a very fluffy cake icing. 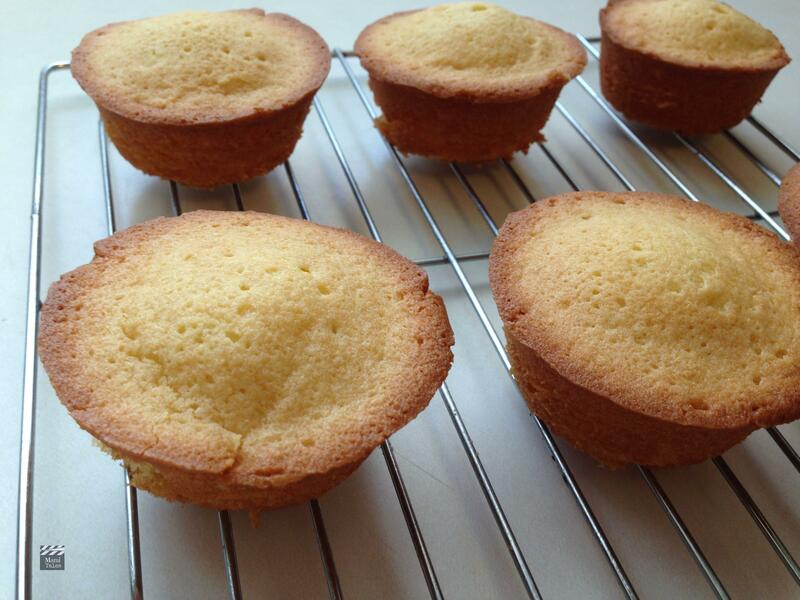 Pour the dough into a pastry bag, then squeeze onto the greased cupcake pan, filling the tins 3/4. The dough with look like pipped icing, but as soon as you put it in the oven it will settle. Bake in the oven for 20-25 minutes, until the tops are golden and a cake tester or toothpick comes out clean when inserted in the center of the cupcake. Let cool off for a bit in the pan, then transfer to a cooling rack with the help of a fork, working the cupcakes out of the pan gently. While the cakes cool off, put the cup of whipping cream in the mixer bowl and use the wire attachment. Whisk in medium speed until the cream starts to firm up. Add the two tablespoons of sugar and the dash of vanilla and increase the speed little by little to full. Once the cream forms soft peaks, stop the mixer. Once the cupcakes are cool, use a very sharp knife and half them horizontally. Use a teaspoon of jam and top with a tablespoon of whipped cream. Close the "sandwich" with the top of the cupcake. Dust with caster sugar, and you're set! The original recipe adds a teaspoon of baking powder to the flour/salt mixture, and then 2 TBSP of milk to the whole mix at the end, to make the dough more manageable to pour. As I mentioned in the post, I forgot to add these two elements, and my cupcakes turned out light and delicious... just a little hard to handle to pour the batter onto the tins. 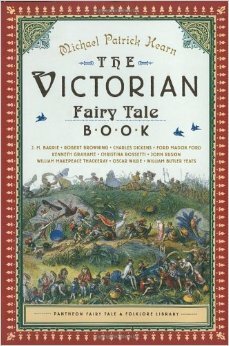 The Victorian Fairy Take book does not pretend to embrace all aspects of this vast and varied genre. Instead, it includes only outstanding examples of imaginative fiction and poestry, several by writers who were among the greatest authors of their time. […] Some amuse, some enchant, some satirize, some criticize — after all, no one creates and alternative world who is content with his own. Whatever their authors’ intentions, these selections, reunited with illustrations from their original editions, display the abundant riches to be found in the Victorian Fairy Tale”. Hearn, Michael Patrick, The Victorian Fairy Tale Book” p. 23. One of the stories in the book is the Mary de Morgan, called by Hearn as one of the best writers of her time. This tale is pretty interesting, as the lead princess in it is a very evil and vain woman, who doesn’t want to marry so she won’t have to stop practicing sorcery in order to keep her beauty. It is, like all other Victorian tales, a moral story where the princess gets dealt a taste of her own wickedness in the end. 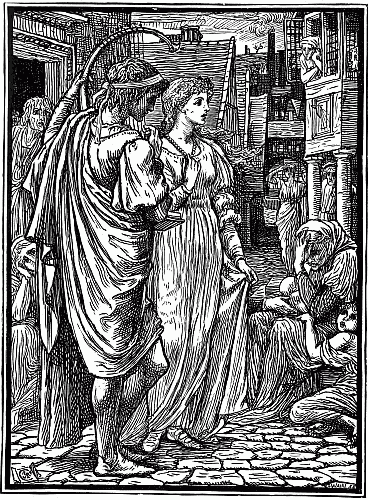 I also found this tale available online through the Gutenberg project, and you may download it or read it by Clicking here. Hope you enjoyed our trip to the Victorian era! And now, with some Victoria Sandwiches and a good cup of tea, we’ll have our own Victorian tea party and read more of our wonderful book to go with it. Enjoy! Thanks for sharing this tasty treat and interesting stories with the #KidLitBlogHop! You’re very welcome! So glad you enjoyed them! It’s a really interesting period. I absolutely LOVE this post! You’ve made such a fun, authentic activity out of Victorian fairy tales. My 9 year old daughter would just love to do this! Sharing across my social networks. Thanks so much for stopping by the Kid Lit Blog Hop! I’m so glad you liked it! I enjoyed putting this one together very much. Thanks for visiting and I’m glad I found the Tasty Tuesday linky!